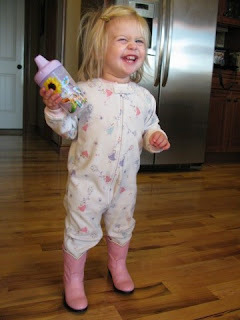 Eva loves shoes....especially her pink cowgirl boots that were handed down from her cousin Lilah. Sometimes I have to hide the darn things because she wants to wear them constantly. Almost every morning she will go find them and put them on over her pajamas!! I think the her favorite thing about the boots is the sound they make as she is walking across the hardwood floor. She will stomp around watching her feet with the biggest grin on her face. 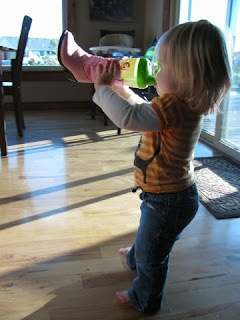 She even discovered that the boots can also serve as a koozie for her sippy cup. What a crazy little girl!